What was it like to make Tyrone? It was definitely a journey. Tyrone’s design wasn’t fully realized until several weeks into the rehearsal process. Originally, “bad” Tyrone had a Mohawk, ear and nose piercings, black hair and a longer goatee. Then we had to quickly get moving on the back-ups and the version that rips apart. Of course, in the end, it was work well rewarded. The show was great and Tyrone was the star. 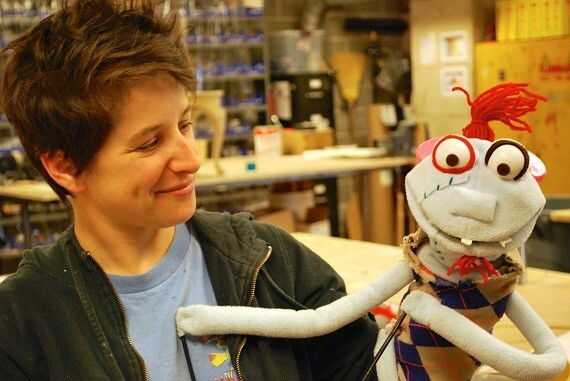 What was most challenging about making such a devious hand puppet? Tyrone’s action on stage is very demanding compared to a normal prop, and he suffers quite a bit of abuse on a nightly basis. His pupils fell off, his eyes came loose, and because of all the fake blood, we had to give him nightly spot cleaning and weekly deep cleans. He was in constant need of attention. How did this experience differ from your other work at the Alley? Tyrone was unique in that he was a character in the show—he looks back at you like a little person. When he went on Steve’s hand, he literally came to life. What do you love most about being a Props Artisan? I never do the same thing two days in a row. Each show, every prop has a completely different set of parameters. So even when you’ve built, say, a puppet before, this puppet will be a completely different journey than the last. And it helps that the prop shop here is full of great people.